The global aviation cyber security market is fragmented with the top five companies accounting for 59% of the total market in 2016, states Transparency Market Research (TMR), a market intelligence company in its latest report. The competition level is high in the global aviation cyber security market, especially because of mergers and acquisitions and other collaborative efforts taken up by leading companies. This strategy is also helping the companies to add unique product and service offerings to their portfolio and benefit from expanded consumer base. As per the TMR report, the threat of new entrants is low as it is difficult for new players to enter, especially if they are not big. This is also because bigger players enjoy customer loyalty. Leading players within the market are: Raytheon Company, BAE Systems Inc., Thales SA, and Harris Corp. 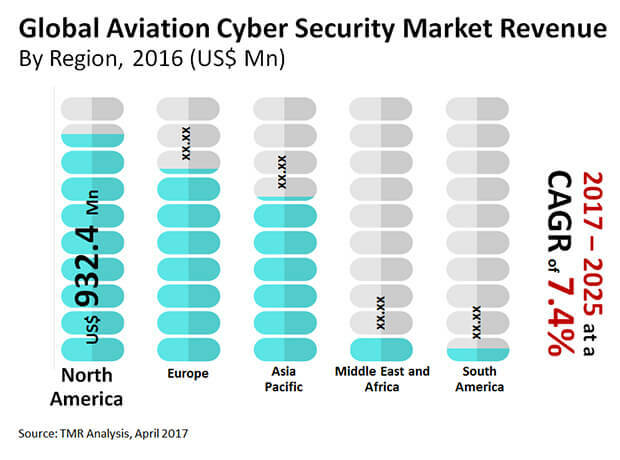 The global market for aviation cyber security is anticipated to expand at a 7.4% CAGR between 2017 and 2025, reaching an evaluation of US$4,759.3 mn by 2025. On the basis of service, the demand for managed security solutions is currently high and is estimated to account for a whopping 73% of the total market and will exhibit a 7.4% CAGR from 2017 to 2025. However, it is the training service segment that will expand at the fastest pace over the period from 2017 to 2025, by expanding at a 7.9% CAGR. On the basis of geography, the global aviation cyber security market is expected to be led by North America. But, the market will suffer from stagnancy, being a mature market, and therefore no new opportunity is to be expected in the region. On the other hand, the market in South America will emerge as the most promising one and shall expand at a 12.8% CAGR between 2017 and 2025. As per the lead author of this report, the growing incidences of cyber attacks as well as the increasing complexity of these attacks are driving the demand for aviation cyber security market. An increasing number of aviation companies are investing extensively on the enhancement of their IT infrastructure and this increase in the adoption of commercial aviation services will boost the growth of this market, especially in developing nations in Asia Pacific and South America. The demand for improved aviation cyber security solutions such as risk and compliance management, identity and access management, unified threat management, and vulnerability management for the aviation sector will push the growth of this market. On the other hand, the market is restrained by high cost of deployment of advanced aviation cyber security solutions which is deterring many small scale aviation service providers from adopting them.